Few months back I had a chance to know about this performing art of Japan from Prof. Sumio Murijiri, who is a Fellow of Tokyo Foundation and a project scholar of Waseda University, Theater Museum, Tokyo. He is also a visiting professor of Mangalore University. His research focuses on the comparative study of Hayachine kagura ( A performing art in Japan) and Yakshagana (A folk and semi-classical performing art of coastal Karnataka). I was working for visual media and my work during that time was to carry out research about art and culture of coastal Karnataka for television programs. I approached the professor to know about his research and to take get a sense of his analysis of Tulu culture. During our talks the professor told me about Hayachine Kagura. He showed me the photographs and videos of this art. He gave me an article written by him about the similarities between these two art forms. It was interesting to know about two art forms which are centuries old and are geographically separated by thousands of miles to have some striking similarities between them. In Japanese language, Hayachina means ‘sacred mountain’. As we know most of the Japanese relegions give a great importance to the mountains. For them these mountains are life and God. There are many villages in the foothills of these mountains following the age-old traditions of Japan.These villages are isolated from the modern towns which makes them sustain their traditional lifestyle like they do. There are many Kaguras still existing in these mountains, Hayachine kagura being one among them. Hayachine Kagura was initially a part of royal traditions. Gradually, it got separated from the palace and developed in to being a folk art. 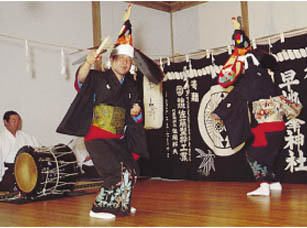 Hayachina Kagura is performed in villages. Just like Yakshagana, there are many troups which roam from one village to another. These troups perform only in the pre-decided villages called as ‘kasumys’. It rarely happens that one troupe performing in the village allocated to other troupe. But when this thing happens, two artists from opposite troupes have to wear the Lion Mask and battle it out. The one whose mask falls first or the one whose lion’s tongue comes out will be the loser. The artists keep the box containing the dress and other things in a house called as the ‘Kagura house’. This is either a priest’s house or the house of a daughter of an artist from their own troupe. The villagers have a great deal of respect for these houses. The stage to perform kagura is usually the front yard of a house. The stage set-up is quite simple. The stage is open from three sides and the audience can watch the performance from these sides. The backdrop of the stage carries the symbol of the troup. There is a special ritual to mark the taking of the dress from the box. Then a lion dance follows. The initial phase of kagura is of prayers. Then the performance starts which is full of hand movements. Unlike Yakshagana, there are no dialogues to the charecters. The artists have to say everything from their facial expressions and hand movements. Sometimes the charecters are seen wearing the masks and sometimes without the masks. One more feature of this kagura is all the actors are given same preference. In Yakshagana that is not the case. Senior artist is always considered superior to the young artists and they appear in the later phase of the performance of yakshagana. In Kagura the singer of the backstage play a vital role, which makes him the key person or a director of the of the show. 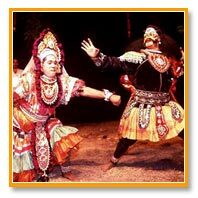 In Yakshagana, the basic scripts are usually are based on ancient mythology and are taken from the writings of ‘Parthisubba’. Hayachina Kagura also follows the same path. The Kagura songs are based on the traditional mountain worshipping scripts of Japan. Professor Morijiri finds lot of such similarities between these two art forms. There should be more research on this area. Poorna Chandra Tejaswi has always been one of my favourite writers. His writings cover a wide range of topics from the Latin American lifestyle to the flora-fauna of Western Ghats. The disciplines of his work range a great deal from novels, short stories to non-fiction to transliterations. His Millennium series is undoubtedly a unique concept by itself. In this series, he introduces Kannada book lovers to the wonders of the world. The subjects such Apollo moon missions, World wars, Inca-Aztec civilizations are really a treat to read. Today, I thought, I would pen down my views on Karvalo – one of the widely read novels of Tejaswi. 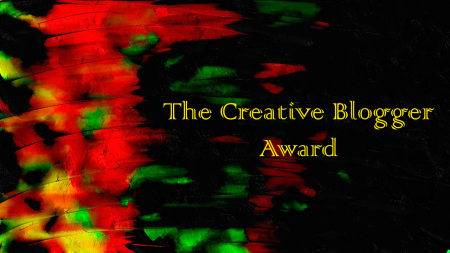 This novel has been translated to many languages all over the world, which shows its immense universal appeal. Karvalo is set in a remote village on the foothills of Western Ghats of Karnataka. The way this story explores many interesting things about human existence. Why are we living today? What made us exist the way we do today? What if our evolution had taken some other path and ended up in becoming something completely different from homo sapiens. What if dinosaurs had managed to exist today, battling all the natural calamities that they faced? There are many such questions which pop out as you go through the pages of Karvalo. These are the fundamental questions which kept on coming back from the days of stone age man to the days of Charles Darwin and to this era of DNA technology. In Karvalo, the protagonist is a well educated farmer, who is also the narrator of the story. In spite of his great interest in rural lifestyle, his unsuccessful agricultural work makes him contemplate to quit and head towards the city. During this time he meets Karvalo, a middle aged scientist. In their first few meetings they discuss the difficulties the protagonist faced in his field. There is another interesting character Mandanna, who makes his appearance in the initial stage of the novel. He is a local cowboy and a sort of side-kick to Karvalo. Mandanna is considered to be a good-for-nothing fellow by the villagers and his friends alike. The narrator was surprised to see that Mandanna and Karvalo share a close bond like a scientist and a research assistant. He wonders what is the thing that brought these opposite characters to a common platform. What is that a scientist finds so special in a local cowboy? As the story moves, we see the narrator getting an explanation from the scientist himself as to the importance of Mandanna in his work. Mandanna might have been labelled as a dumb guy by all, but he too has some unique skills in his kitty which makes him a special asset. Mandanna’s ‘observational skill’ is the thing which made Karvalo choose him as a person to help him with his research work. As Karvalo says, Mandanna is very good at identifying different creatures. One fine day Karvalo reveals that his fellow ‘student’ Mandanna had seen an endangered reptile in the jungle, which was previously thought to have been extinct. It is a flying lizard which opens a wing-like organ when it has to fly from one place to another. Karvalo is now on a mission to find this creature. He asks the narrator to join his team, which already includes the scientist himslef, his fellow student Mandanna, a camera man and a womanizer cook. Their journey to find that endangered flying lizard is the story of this novel. The series of discussions and revelations that take place in their expedition gives a deep philosophical aspect to the story. The questions like ‘Do they find the flying lizard?’ become immaterial when you find that it is not the lizard but the truth of life what they are in search of. I find the serious discussions by the characters very interesting to read. In one chapter, there is a discussion about the existence of God. A believer of God thinks about the rising sun, stars and wonders of natures and take them to be the proofs for the existence of God. But quiet ironically, these are the same set of examples that make a non-believer think that there is no such thing as God and all these things work on their own. Finally, we have to believe that it is the examples which are true and the all the conclusions that we draw from the examples are myths. What a brilliant thought? Yes, you find lot of such discussions in this novel, which can give you a whole new idea about our universe. This is a story that makes you think about the wonders of nature. Some people may call it God; to some it is an ever-existing world. Call it the way you perceive, but it cant stop you from thinking about the universal question. If you have not experienced the thrill of this novel yet, I suggest, give it a try.